Welcome to my PMC Fundraising Page! This is my third year with the Pan-Mass Challenge, and my first time riding, joining my dad and my sister in the fight against cancer! 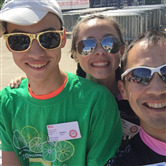 On August 3, 2019, I will join my family and Team Kermit in riding 84 miles across Massachusetts as part of the PMC, which raises money for life-saving cancer research and treatment at the Dana-Farber Cancer Institute in Boston. Last year, 6,400 riders participated in the PMC, including more than 900 living proof, or cancer survivors. Team Kermit also collectively raised $479,585 last year, contributing to the record breaking $56 million donated towards cancer research. For my first PMC ride, I have set a goal of $9,000. With your help, I am confident that this number can be surpassed as we fight together to rid the world of cancer. Please also check out Papa Swu's and Ella's page!